By the Emperors Y-Fronts I thought this thing would never get finished! I estimate 10-15 man hours spent on this, from sprue to the finished item. 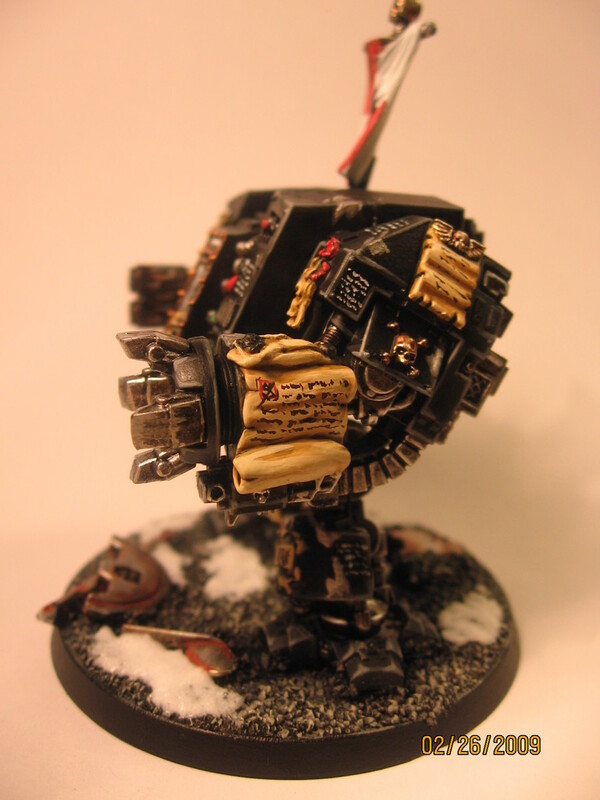 It totally made me sure that I would NEVER want to paint another AoBR dread, EVER! So, here it is! C=C welcome! Author PaulPosted on February 27, 2009 February 27, 2009 Categories Miniature painting and techniques, Warhammer 40k, Warhammer 40000Tags 40K, Assault On Black Reach, Black Templars, Citadel Miniatures, Completed work, converting, dreadnought, Games Workshop, Green Stuff, miniatures, Painting Challenge, Pledge, space Marine, Space Marines, Wargames, Warhammer 40000, Warhammer 40k3 Comments on Completed! the AoBR Dready! While clearing out lots of unused stuff on my computer I found these pictures of a Forge World dready that I painted a few years back. Alas I no longer have him, he made his way to my buddy Matt back in the Motherland, and he now watches over it. I feel I should have at least finished the base on it, but oh well, I am sure Matty has finished the job! I will probably end up getting another one at some point, as Nurgle has always held a soft (read: rotting) place in my heart. The deathguard will return once more, i’m sure. This weekend I plan on picking up some green stuff so that I can fill the gaps on my Black Templar dready, and then I can prime him! 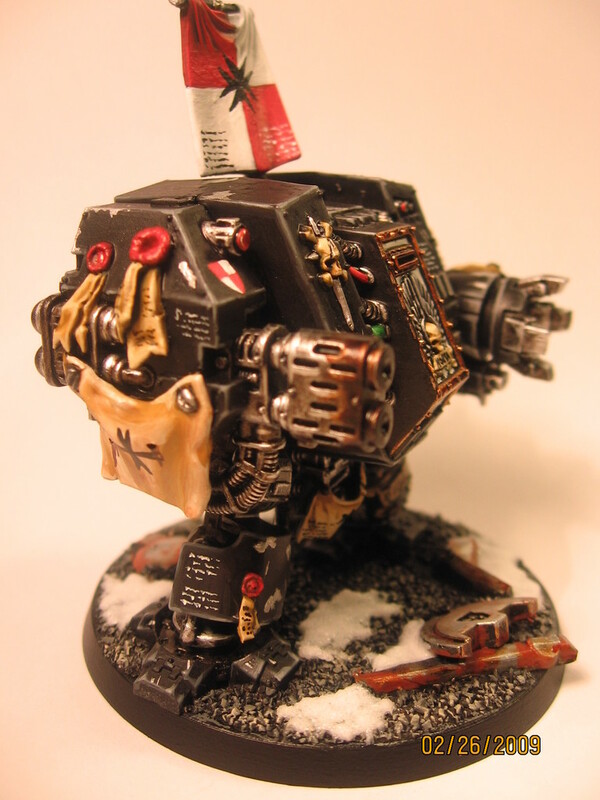 I really want to get on board with constructing my Templars, but I need the upgrade kit, and $30 just isn’t available right now. Still, I can do some basic marines that haven’t received their full robes yet I guess. Matt Crump will be putting a page up here soon, Matt was a Golden Demon finalist recently, in the Warhammer Single Mini category. He asked if he could put a picture of his entry up, so I offered him to do his own page here at WCF, as his work is stunning! I recently went in on the Assault on Black Reach set with my buddy. He snaffled the Orks and a couple of SM bits and I had the remaining Space Marine figures. 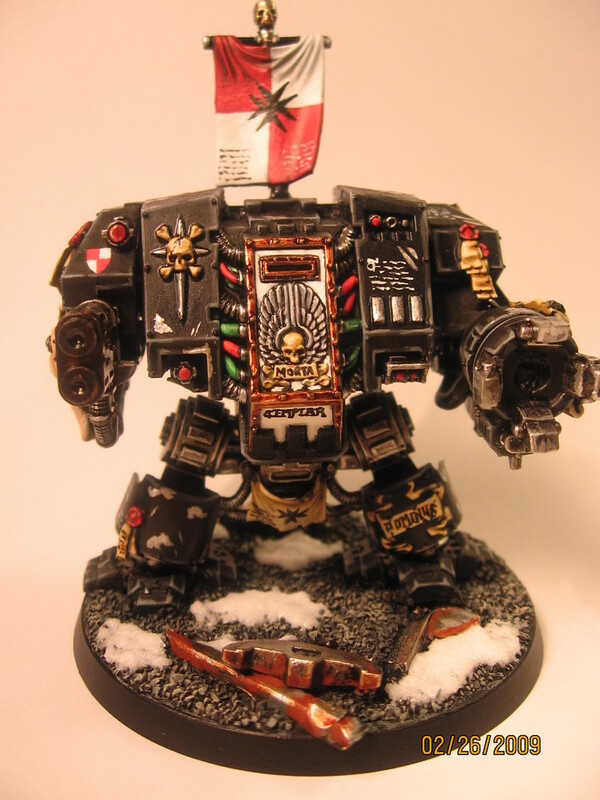 I want to do a Black Templar army and figured this would be a good way to get some troops and whatnot. First up on the construction block is the dreadnought. The snap-fit assembly of the AoBR stuff is great, although some gaps are apparent. There is still a part of me that thinks that these snap-fit mini’s are somewhat ‘cheap’, but slowly I am suppressing that train of thought. This fella was put together very quickly, and was very easy to do. I yoinked a couple of pieces from my Space Marine Battle Force sprues to add on as well. 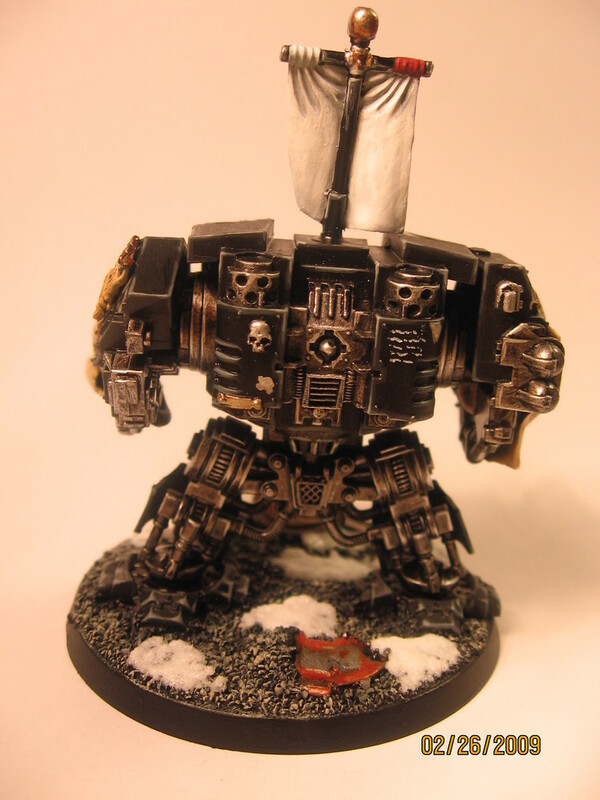 Unfortunately the casting of this dreadnought is such that unless you are prepared to do some really, and I mean really, intense converting, repositioning etc, he is in a kinda boring pose. I added a couple more purity seals, a scroll on the left arm/shoulder area, a loin cloth and a banner. I am still undecided as to whether or not I should add a smoke grenade launcher just in front of the banner pole. I added a couple of pieces of debris to the base, not too much, as I don’t want it to detract from the final model. I have some ‘green-stuffing’ to do and some battle damage that I want to add as well. Watch this space for further developments!